Investing prudently requires understanding economic fundamentals. Here's some insight into current economic conditions and the kind of ongoing analysis required to manage wealth prudently for the long term over up and down economic cycles. The economy is measured quarterly in terms of gross domestic product (GDP), which is the sum of four factors: consumption, investment, government and net exports. Consumer spending is by far most important, accounting for 69% of U.S. economic activity. The key to strong economic growth, then, is a strong American consumer. 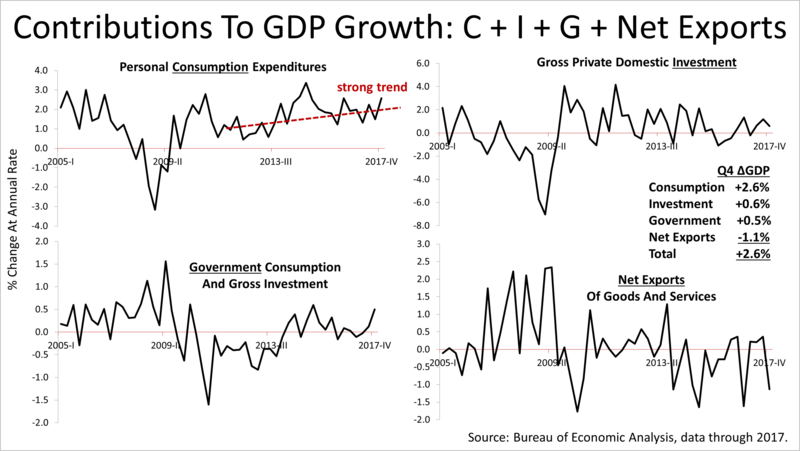 However, business investment and government spending are together not even half as important a factor in growth of the U.S. economy as consumers. If consumers keep spending, the good times for the U.S. could keep on rolling, and there is some reason for optimism on that score. Economic growth shows up in profits of companies and is the key determinant in the value of stocks. Profit expectations at the Standard & Poor's 500 companies grew sharply in the opening quarter of 2018, according to independent economist Fritz Meyer, and the outlook for consumer strength was bright despite an 11.8% correction. Please let us know if you would like to receive our wealth management news analysis by email. This article was written by a professional financial journalist for Kondo Wealth Advisor and is not intended as legal or investment advice.